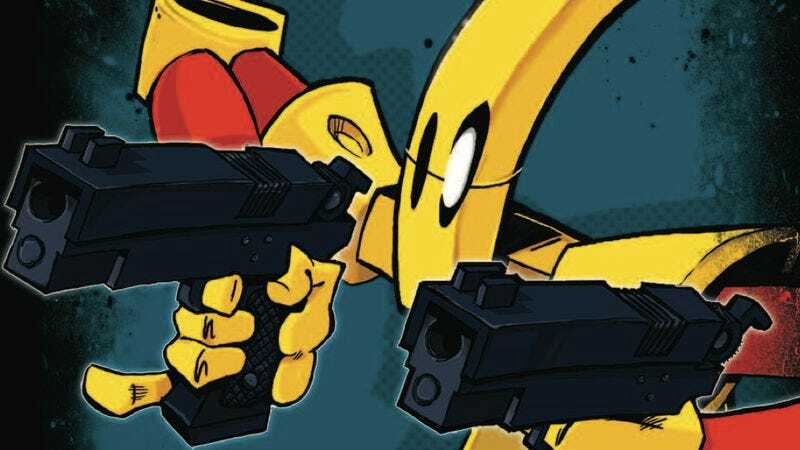 Rob Schrab’s Scud: The Disposable Assassin is a comic book so thoroughly of its time that it feels like the physical manifestation of ’90s indie comics in the way that Sandman’s Morpheus is the embodiment of dreams. The title character’s elongated limbs, his sarcastic wit, and the vivid black-and-white art of its first 20 issues were reflections of the young Schrab’s personal style, but they were also a crystallization of a larger, thriving indie comic style. Pouring out of publishers like Fantagraphics, Slave Labor Graphics, and even the first few years of Oni Press, indies bore the DIY spirit of ’70s and ’80s comix but benefited from a cleanliness missing in the crowded, messy art of those older books. Scud was a perfect example, each issue a snide chunk of cartoon violence as cool as it was pretty. Scud: The Disposable Assassin for Sega Saturn, the rare video game adaptation of a non-Marvel or DC superhero, is sometimes cool and momentarily pretty, but in abandoning the look of the comic, it loses much of its soul. The game is equally of its time, an adaptation that sometimes comes frustratingly close to capturing its source before it’s drowned out by once trendy technology. Scud the comic is perfect fodder for a video game. In its technologically advanced future, killers can be purchased from vending machines. Pop in a measly sum of three franks (not francs, mind you) and you get a Heart Breaker Series 1373 model assassin, ready to take out a target of your choice with customizable settings for how you want the job done. The Scud starring in both the comic and game is activated to take out Jeff, an aggressive beast with an electrical socket for a face, mousetrap fists, and gaping Twizzlers mouths for knees. When Scud spots the warning label on his back advising customers to keep in mind that he’ll self-destruct upon completing his mission, Scud maims Jeff and puts it in the hospital to create a loophole that’s keeping them both alive. The comic uses this grotesque premise to send Scud off on all kinds of jobs as a mercenary, earning enough to pay Jeff’s hospital bills and keep on ticking. Schrab’s flair for the comically absurd that later manifested in his television work—writing and/or directing the likes of The Sarah Silverman Program, Childrens Hospital, and Community—was founded in these books, but his wiggly clean art added a dimension of inhuman dynamism. Full pages of his work would shift between spare images of Scud yelling to some hyperdetailed piece of science-fiction tech, creating space for the humor and action to expand and contract. SegaSoft’s game arrived in 1997, dripping with the rounded, simple computer-generated animation that was inescapable in the middle of the decade. Scud’s black-and-white world was exchanged for the reflective CG animation seen in a dozen Liquid Television segments and “Treehouse Of Horror VI.” Shifting from animated shorts that recapped the early issues of the comic to stages where Scud walks from left to right shooting automatons, security guards, dogs, and other nondescript enemies, the game uses the most basic action of the time to bring the book to the screen. While the stilted line delivery and inappropriately dramatic music don’t help to capture the feel of the book, it’s the abandoning of the original look that does the most damage. Scud himself is almost perfect. The way his extra-long limbs warp as he strides and the way he bends in the middle to fire his twin pistols look like Schrab’s art come to life. Boss fights and scenes where the perspective shifts to first person nail some of the fluidity of the comics as well. Outside of those moments, though, the drab backgrounds and dark color palette smother any essential Scudness that was there. Of the game’s half dozen or so stages, only the first feels like it’s not just an arena on loan from another video game. Even when Scud finds himself assaulting a bulbous space station, it’s still just a generic morass of computer-generated clutter. It’s understandable why SegaSoft chose the style it did. In 1997, this sort of CG animation was used as the sole sales point of some games. Squaresoft’s Final Fantasy VII, released the same year as Scud, sold itself with ads showing only its CG cutscenes, for example. While Scud’s violence would certainly make it palatable to the masses eating up contemporaries like Resident Evil, its humor was restricted to more niche games like Doug TenNapel’s Neverhood. And black-and-white video games? That wouldn’t become de rigueur for another 12 years. Had SegaSoft mimicked Schrab’s style, the Scud game would’ve been remembered for a forward-thinking and unique look. Even if it had retained the same computer-generated graphics, rather than the hand-drawn sprites that had become so unfashionable in 1997, removing the dank colors and shadows of the finished game would have restored some of the same negative space that made the comic’s art so effective. In the process of breaking from era conventions, Scud: The Disposable Assassin for Sega Saturn would have lost its essence as an amalgamation of ’90s gaming trends, but it would have also made for a more lasting addition to Schrab’s classic series.